When we chose to visit the Huntsville Botanical Gardens and Butterfly House, we didn't know we were in for an additional treat. Since it was soon to be Fall, they were having their annual Scarecrow Trail. All along the paths as you strolled through the gardens, there were scarecrows. I didn't know you could do so much with straw and fabric! There were entire family scenes made as scarecrows. The exhibit provided businesses, organizations and even individuals to display their creative talents and to advertise since each had a sign showing who provided it. 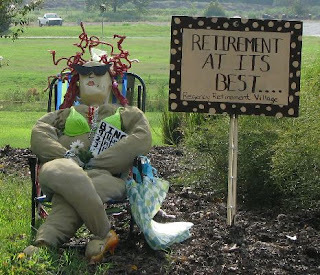 Although the gardens had plenty of blooms (early September in Alabama), the scarecrows throughout made the walk all the more entertaining. There must've been a hundred of them. I took photos of what I considered to be the best. View Scarecrow Trail photo album.